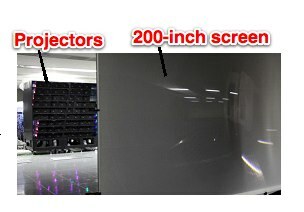 3D overkill: If you thought Toshiba’s 20-inch naked-eye 3D TV is cool, think again: Japan’s NICT (National Institute of Information and Communications Technology) has developed a projector system [JP] that makes it possible to produce 200-inch 3D pictures that can be viewed without having to wear 3D glasses. A total of 64 projectors are used to project 3D “images in HD” (NICT didn’t reveal details) onto a screen that’s 2.5m high and 4m wide. The technology was co-developed with JVC Kenwood, and needless to say, it’s a first. NICT says that inititally, they encountered problems with the quality of the images but then boosted brightness, colors and other factors by using a special film for the screen and building a condenser lens into it. The institute wants to use the screen for digital signage solutions, public viewings, and showrooms. 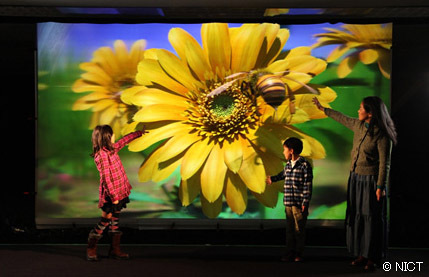 NICT plans to develop a system that’s boasting 200 projectors as the next step.